A couple of caveats before I jump into this discussion. Firstly, I'm not going to share anything here that hasn't already been said by leagues of trans writers and activists, and I forever defer to them. Let Google be your friend, read and learn. Second, I'm still very much learning about my privilege in this area, so this is all at about a 201 level. But I feel it I would be remiss if I didn't write a few things about trans* inclusivity and its importance to my personal brand of feminism. I've woven this perspective into my writing on numerous other topics before (like reproductive rights, language, intersectionality) but I want to really tackle it head on today. Basically, through my journey with feminism and learning from trans and nonbinary people, it became so totally evident to me that trans issues are feminist issues and a feminism that does not actively advocate for and include trans voices, experiences, and issues is at best incomplete; at worst hateful and oppressive. The links between trans activism and feminism are so incredibly obvious to me. They both center on two key points: bodily integrity and the right to identity. Bodily integrity is integral to my feminism. Put most simply, it means that I don't get to tell you what to do with or how to view your body and vice versa. Similarly, identity is something I also view as deeply personal and no one can or should police another's various identities. These were realizations I came to so readily and easily in my feminist evolution that it's hard for me to imagine seeing trans activism as not inherently compatible with feminism. Sadly, this perspective is not shared by all and some "feminists" even work to actively exclude and harass trans people. One of the biggest things that I have learned from the trans* people I follow on Twitter and whose blogs I read, is just how virulent anti-trans feminists can be...namely Trans-Exclusionary Radical Feminists (TERFs.) Seeing their hatred for trans women, in particular, has only solidified in my mind just how critical trans* advocacy/support is for an ethical feminism. Intimidating clinics that provide healthcare to trans* people is a feminist issue. It's a social justice issue. It's a human rights issue. Look at that again! 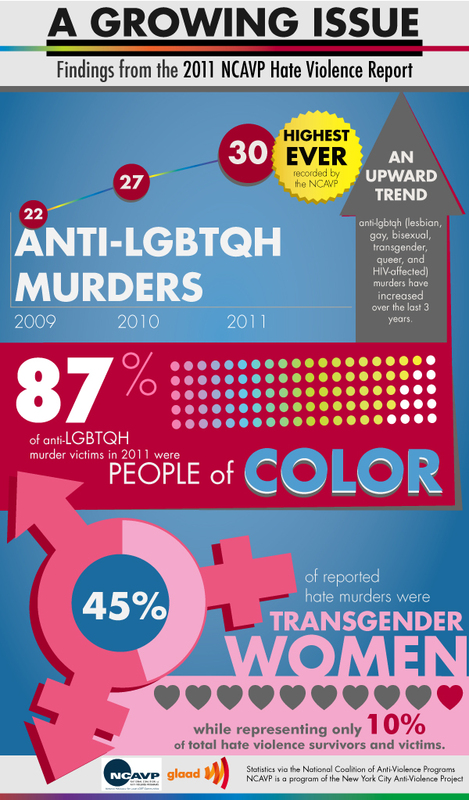 45% of reported hate murders were transgender women. Let that seep into your brain. I mean, we, as feminists, are facing issues like this, but Brennan and other TERFs want to focus on denying these people access to public women's restrooms?? Are you kidding me? No matter which way you slice it, it has become exceedingly clear to me that trans inclusion and advocacy is absolutely critical to my intersectional feminism. I had a brief interaction with a radfem a few days ago and was called a "liberal feminist" who "isn't really doing anything." You know what? I will take that empty criticism any day of the week if it means that I am differentiated from the sect of feminism that promotes transphobia and transmisogyny as if it is some badge of honor. That disgusts me.